mind the gap: Google GeoEye: 'Big Brother' for the whole World? Google GeoEye: 'Big Brother' for the whole World? JOHN DE MOL TOOK THE OLD PRISON CONCEPT of confinement, absorbed its mentality, attached psychological strings, created a manipulative environment, introduced conflicting personalities into it, televised it via mass media, commercialised it by asking people to pay by "voting", and produced through Endemol one of the most popular reality TV shows "Big Brother". While the producers claim that the show is not scripted, it surely remains a prompted show. The show now runs to various international formats in nearly 35 host countries, and is broadcast to more than 100. The central concept of the show is that one is always being watched all the time so far as one is within the premise of the designated Big Brother house. Expand this premise to cover the whole world, and we get close to the Google GeoEye project. 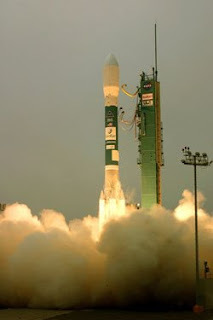 On September 6, 2008, the world's most-accurate commercial imaging satellite, the GeoEye-1 was blasted off into the space. The 4,300-pound satellite moves from the north pole to the south pole in a 423-mile-high orbit at 17,000 miles per hour (or 4.5 miles per second). The spacecraft can take photos at a resolution of up to 41 centimeters - close enough to zoom in on the home plate of a baseball diamond. Interestingly for GeoEye, Google as a partner is the second biggest customer who would use the data (real-time images of the entire world) for purely commercial purpose. 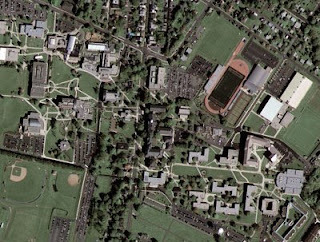 The largest customer of GeoEye data consumption remains the U.S. Government agency - NGA, that has been putting satellites into the space since 1970's to 'spy' on targets within the US and abroad (such as the Kremlin Square of Russia). While the NGA capabilities can even read from space the headline of the newspaper that one is holding on the ground, for Google however, the max permissible zoom limit of up to 50 cms would apply. This means that while you can easily see the red Mustang on Hawthorne Boulevard junction in LA, you perhaps won't be able to recognise the face of the blond seating on the passenger seat. In other words, the satellite can see, but can not show to you all those details because of the current legislative limitations. With the next launch of a more powerful 'prying eye' - GeoEye-2 scheduled around 2012, which is capable of going to the resolution of up to 25 cms, Google surely hopes that the zooming restrictions would be relaxed. In other words, you might be able to spot people anywhere on Earth. And you might be able to do it all the time. And your target may not even be aware of your act or intent. If you start 'selling' your 'show' on, say, YouTube, you might have your own commercial version of "Big Brother" show. If the idea sounds familiar you may already have watched the 1998 superhit movie The Truman Show written by Andrew Niccol (see trailer below). "We're commercializing a technology that was once only in the hands of the governments," Mark Brender, GeoEye's VP of communications said. "Just like the internet, just like GPS, just like telecom - all invented by the government. And now we are on the front end of the spear that is commercializing this technology." There already are enough surveillance cameras on our roads, streets, stations, offices, malls and all public places. As the technology improvises and more GeoEye's start orbiting the Earth prying downwards, "Someone would always be watching you..."
[Above: Actor Jim Carrey plays Truman Burbank in the 1998 Hollywood film The Trueman Show. Depicting a Big Brother like Reality TV show on extremes before the Big Brother format was even possibly conceptualised, the film chronicles the life of a man who does not know that he is living in a constructed reality soap opera, televised 24x7 to billions of viewers across the globe. Go here for more on John De Mol. And here for Endemol official website. Go here for official GeoEye website. Looks like their business model expects you to pay for any image that you watch or use. Watch out! Go here for the related story at wired.com. This comment sums it up "Thanks to my real-time GeoEye connection, I can see what you're posting even before you submit it. Hey, watch your language there!"